Have you ever wished that your older News Posts from last month could automatically vanish from your website so that your visitors don’t get confused and overwhelmed? Now you can solve that problem with our new News Post Expiration Dates feature! This new feature is available to Premium Plan and Premium Plus Plan Members and will allow you to set a specific date and time that you want your News Post to expire. It’s very simple to use. Each News Post can be controlled individually or you can set a default expiration time in your general settings. 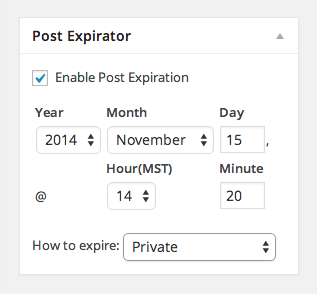 You determine the time and date to expire the post and then the method of expiration. You can set the post to switch to a draft post, a private post, you can delete the post entirely or you can change and add categories to your post at a certain time frame. There are a lot of options and ways to use this plug in, especially with some of our more advanced themes that have more post category options. Have fun with it! This enhancement is available for Premium and Premium Plus Members. It is not activated by default, so please visit the link above for activation instructions (it’s simple).